This is a script for generating treasure packages according to the tables in the AD&D 1e Dungeon Master’s Guide. Please consult that publication for details on the magic items appearing in the results. Also, please note that results will be downloaded as a Rich Text File (RTF) to preserve layout; the resulting file can be opened with any word processing program (WordPad, MS Word, OpenOffice, etc.). Each treasure package has percentage chances for different types of treasure appearing. It is possible to have a package generated with no treasure! I have also incorporated the gemstone descriptions from the DMG so you will know whether that topaz is translucent, transparent, or opaque! 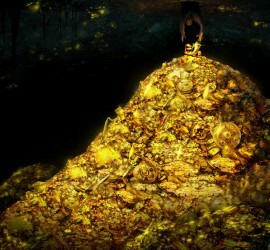 Seriously, though, this can be very useful when describing the treasure to PCs who don’t have a background as jewelers. This script produces a RTF document for download instead of a plain text file like my other random generators to date. You can change the file extension to TXT if that’s a concern, although you should then make sure to open the resulting file with a text editor that respects formatting/spacing (i.e., Wordpad, MS Word, or OpenOffice instead of Notepad). If you are running the script multiple times, be sure to clear your previous selections if you don’t intend to generate another set of the same treasure packages. Future enhancements to the script will likely include the random generation of specific jewelry descriptions rather than just the terse indication of material given in the DMG. As usual, feedback and suggestions are most welcome and I will do my best to correct errors brought to my attention!